Editor’s Note: Turns out it is not Spring yet in New York and the Yankees’ HOME Opener got POSTPONED due to Snow. The game will made up Today at 4 PM so this blog is Reblogged. 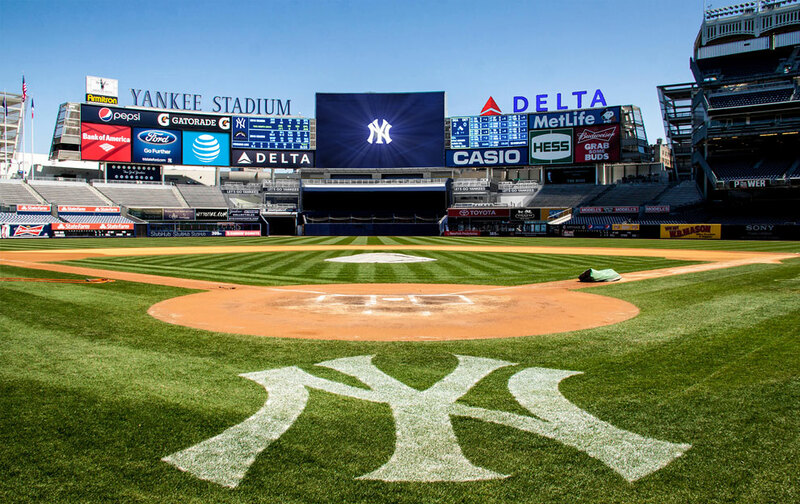 The New York Yankees will be wearing the Pinstripes for the FIRST time this season at Yankee Stadium in a FEW hours as we are all set for the Yankees’ Home Opener. The Yankees started their season NORTH of the border in Toronto against the Blue Jays, despite looking GREAT in the first TWO games of the season, the Yankees are on a TWO game LOSING streak as they get ready to face the Tampa Bay Devil Rays at HOME today. Game 1- In case you missed it, I blogged the Yankees FIRST win of the season on Opening Day. The OFFENSE led by Giancarlo Stanton making his YANKEE debut led the team to an EASY win over the Blue Jays. Luis Severino looked GREAT in his first start of the season before handing the ball off to the Yankees’ bullpen who got the job done. Game 2- The Yankees offense continued to ROLL on Friday Night and this time it was NOT the stars of the team. Stanton, Aaron Judge, and Gary Sanchez did NOT have a hit in the game, but the Yankees WON by THREE runs thanks in large part to Didi Gregorious and Brandon Drury who had his first BIG game in a Yankee uniform. Masahiro Tanaka made his FIRST start of the season and outside of a couple of MISTAKES, he was GREAT, before giving the ball to the EXCEPTIONAL bullpen. Game 3- The Yankees had lined up CC Sabathia to pitch game THREE of the series and the big man was EFFICIENT and did not IMPLODE. Tyler Austin had TWO monster home runs in the games to keep the game TIED, but the Bullpen CHOKED. Dellin Betances, once the CROWNED JEWEL of the Yankees’ bullpen gave up TWO runs in his relief appearance and that was the difference in the game. Betances has pitched TERRIBLE in CLOSE games since last August and you have to wonder if his days in the Bronx are NUMBERED. Game 4- Sonny Gray, who many people believe will make a BIG step FORWARD this season, made his season debut on Sunday afternoon. The Yankees were looking to take THREE out of FOUR games in their FIRST series of the season and thanks to a MONSTER home run by Brandon Drury, his FIRST as a Yankee, the team had an EARLY lead. Gray only lasted FOUR innings giving up ONE run and handed the ball to Chad Green who was PERFECT. Instead of continuing to pitch Green, manager Aaron Boone, who was managing his FORTH game EVER as a manager, chose to TRUST other arms in the Bullpen and that BACKFIRED for him. Justin Smoak hit TWO home runs in the game including a GRAND SLAM in the EIGHTH inning that gave the Blue Jays the win and they were able to SALVAGE this series. The Devil Rays come into the Bronx LOSING their first series of the season to the Boston Red Sox at home. The Rays have very LOW expectations this season based on their moves in the off season, trading away some of their STAR players. The TWO teams will play in a TWO game series this week, with the SECOND game being on Wednesday and the Yankees should have NO problem winning BOTH games this week against the Rays. We will see the season debut of Jordan Montgomery today who had a really GOOD rookie season last year before he reached his innings limit. He should NOT have an innings limit this year, so the expectations are HIGHER for Monty this season. The Devil Rays were going to pitch their Bullpen for a start on Monday, but since the game got POSTPONED, they will be pitching their ACE Chris Archer on normal rest. Archer STRUGGLED and gave up FOUR runs in his FIRST start of the season and he has always been a Yankee KILLER so expect him to have a GOOD outing today. Luis Severino was GREAT in his first start of the season and will looking to BUILD on that start on Wednesday afternoon. Blake Snell gave up NO runs in his last start, so RUNS will come at a PREMIUM on Wednesday afternoon for BOTH teams. I EXPECT the Yankees to WIN both games this week before the Baltimore Orioles come to town for a FOUR game series starting on Thursday night. Enjoy the Home Opener today, it is going to be RAINY in the Bronx today so be sure to SUIT up if you are one of the LUCKY ones going to the game.